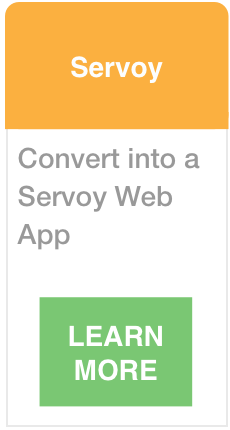 What type of conversion do you need? Available services include the Access to FmPro Migration Service, FmPro to Access Migration Service, PHP Conversion Service, Servoy Migration Service, FmPro Development Service, FmPro Migration Service, BASIC to LiveCode Conversion Service, PHP to LiveCode Conversion Service, Database to LiveCode Conversion Service, .Net Conversion Service, Visual FoxPro Conversion ServiceFmPro Upgrade Service, and the FmPro Migrator Compiler Edition Service. 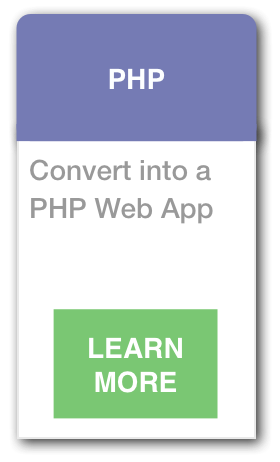 The PHP Conversion feature built into FmPro Migrator Platinum Edition provides an economical conversion process for converting FileMaker Pro database files to functional PHP web applications. This feature includes the conversion of Forms/Reports, Relationships, Value Lists, Layouts and FileMaker Scripts into PHP code. 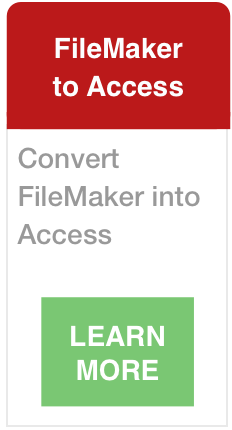 The Access To FmPro Migration Service built into FmPro Migrator Platinum Edition provides a fixed-price conversion feature for Microsoft Access database files to FileMaker Pro database files. This feature includes the conversion of Forms/Reports, Queries, Relationships, Value Lists, Layouts and Visual Basic code. The FmPro To Access Migration Service built into FmPro Migrator Platinum Edition provides a fixed-price conversion feature for FileMaker Pro database files to Microsoft Access database files. This feature includes the conversion of layouts, scripts, relationships, and value lists. The Servoy Migration Service built into FmPro Migrator Platinum Edition provides a fixed-price conversion service for FileMaker Pro, Microsoft Access and Visual FoxPro projects to Servoy Eclipse project files. This service includes the conversion of layouts, forms/reports, scripts, relationships, and value lists. 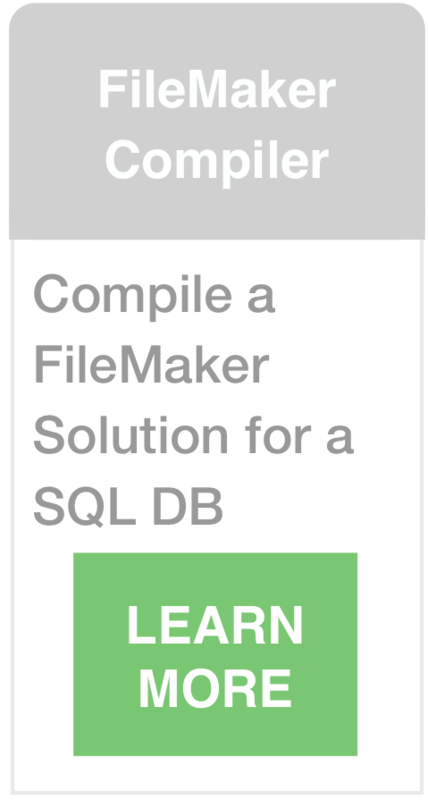 The FmPro Migration Service provides a fixed-price migration of FileMaker Pro databases to other database formats. Database migration target databases include MySQL, Oracle, Access, Microsoft SQL Server, Sybase, DB2, PostgreSQL, SQLite and Valentina. The FmPro Migration Service utilizes FmPro Migrator Developer Edition to provide an automated, high-quality migration process for JPEG images, large text fields and numeric data. The FmPro Upgrade Service provides an economical fixed-price upgrade service for FileMaker Pro 2,3,4,5,6 database files to FileMaker Pro 11. 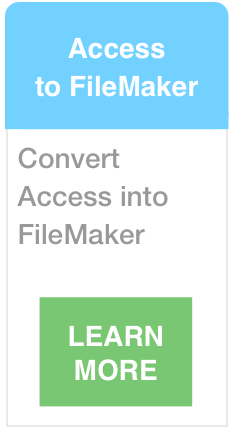 This service provides conversion of multi-file FileMaker Pro solutions including file conversion, scripting and troubleshooting. The FmPro Development Service provides fixed-price and hourly development, eminence and troubleshooting of FileMaker Pro databases using FileMaker versions 2 - 11. Projects can include new development projects, data recovery, database migrations, addition of functionality to existing databases, ODBC data transfer, synchronizing data between databases, and creating charts from FileMaker or other databases. The BASIC to LiveCode Conversion Service included with FmPro Migrator Platinum Edition saves LiveCode developers many hours of tedious and error-prone work converting BASIC files into LiveCode code. 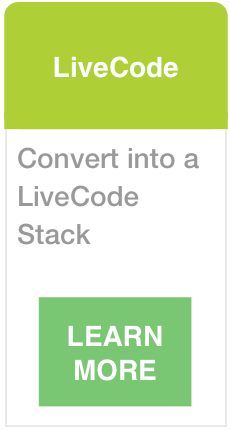 This feature also includes the conversion of VB6 forms and code into LiveCode stack files. The PHP to LiveCode Conversion Service included with FmPro Migrator Platinum Edition saves Rev developers many hours of work converting PHP files into LiveCode code. LiveCode developers can use converted PHP scripts as a starting point for creating interactive internet apps with the LiveCode development platform. Build high performance, no-compromise interactive apps matching the look and feel of the user's own operating system. The LiveCode Conversion Service included in FmPro Migrator Platinum Edition generates a full-featured LiveCode front-end application from FileMaker Pro and Microsoft Access database files. This feature quickly and efficiently converts layouts, scripts, relationships, and value lists into a LiveCode application for building Mac OSX, Windows, Linux desktop apps, or mobile apps (supporting: IOS, Android). 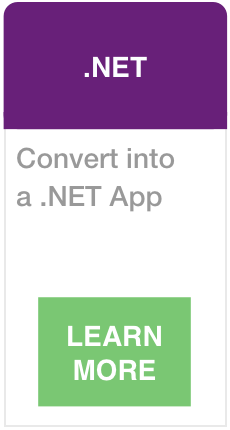 The .Net Conversion Service built into in FmPro Migrator Platinum Edition generates functional .Net 4 database front-end applications from FileMaker Pro, Microsoft Access and Visual FoxPro project files. This feature quickly and efficiently converts layouts/forms, scripts, relationships, and value lists into .Net database applications for Windows desktop apps and web browser SilverLight apps. This feature leverages the automated layout and relationship importing features of FmPro Migrator Developer Edition, along with FileMaker Pro Advanced, Microsoft Access or Visual FoxPro and Visual Studio 2010. 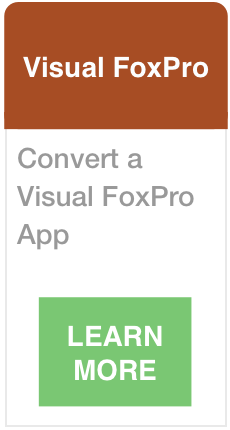 The Visual FoxPro Migration Service built into FmPro Migrator Platinum Edition provides an economical fixed-price conversion service for Visual FoxPro projects. This service includes the conversion of forms, reports, functions, procedures, persistent relations, and DBF data file conversion within a predefined budget. A wide range of target development environments are supported, including: Servoy, .Net 4 Visual Studio 2010, Microsoft Access, FileMaker Pro, FileMaker Go for iPhone/iPad, and LiveCode. All 5 conversion options are included for one fixed price.